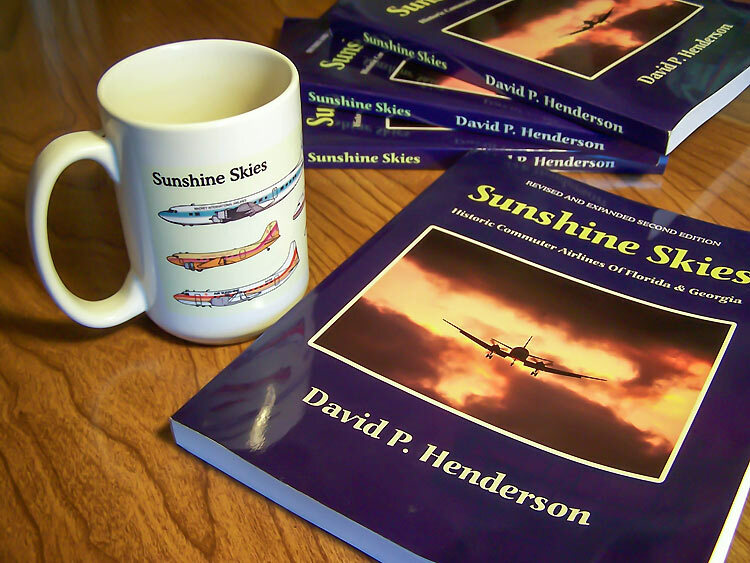 Sunshine Skies : Historic Commuter Airlines of Florida and Georgia is available through the publisher Createspace and at Amazon. Proceeds from book sales offset the costs of maintaining this website and fund the continuing research for future projects. Amazon has recently discounted it by 40% from the original price so now is the time to buy! The heart of the Sunshine Skies research project is the book Sunshine Skies: Historic Commuter Airlines of Florida and Georgia. It was originally published in December 2005 and a revised and expanded edition followed in October 2008. The book traces the histories of over 80 commuter, regional, third-level, local service and intrastate carriers that operated in the Sunshine and Peach states between 1919 and the 1990s. It also contains hundreds of photos, route maps and timetable covers as well as detailed fleet lists. You can learn more about the book and read reviews HERE. The audience for such a narrow topic was predictably small and sales were modest but reaction among the airline aficionados who purchased it have been overwhelmingly positive. I am grateful for the hundreds of messages and emails I've received from readers and I appreciate your support of this ongoing research project. It is truly a labor of love and I enjoy the input and stories from readers, airline employees and fellow airline fans from around the world. Available for purchase through Cafe Press. That's right! Now you can enjoy your favorite hot beverage while checking out the latest updates at Sunshine Skies. The design features 10 aircraft of long gone historic commuter airlines of Florida: Mackey International DC-6, Air Sunshine Convair 440, Shawnee Airlines DC-3, Air Miami DH-114 Heron, Marco Island Airways Martin 404, Dolphin Airways Bandeirante, Chalk's Turbo Mallard, Florida Airlines DC-3, Executive Airlines Twin Otter, and a PBA YS-11. Check out the artwork below. Support your caffeine habit while supporting this website!